1XPortable mini washing machine. Wash Capacity:13lbs. Rated Wash Input Power:300w. Spin Capacity:8lbs. Total Power:450w. Washer Capacity: 10 lbs Dryer Capacity: 6.6 lbs. A set of Washing Machine. ★ Lightweight and portable, this washer/dryer combo performs with the reliability of a professional grade machine. ★ It gets your clothes 90% or so dry when you hang your clothes to finish drying. Wash / Spin Capacity: 8lbs. Easy&Safe:You can see and monitor the water and washing condition.And the child lock on panel can protect your child and family. Compact Design & Large Load Capacity:This machine is compact and lightweight for you to easily move.But the capacity and power allow you to wash many clothes and ensure your clothes are thoroughly washed, rinsed and span. With this laundry washing machine, you will find washing is an easy job. Don't hesitate to buy it now! In addition, this machine features a built in drain pump and a drain pipe which allow you to easily drain out dirty water. Our washing machine is a new semi-auto washing machine, half laundry, half dehydrated. Its large capacity design make you surprise, washing clothes is no longer a chore. Eco-friendly design-less water and detergent used which leads you for money saving. 90 Days Warranty! Premium Quality! Blowout Prices! The two tubs, one for washing and one for spin drying will be useful to you. The machine runs off 120v power and will take up to 10lbs capacity for washing and 6lbs capacity for spinning. Top load twin tub compact design. WonderWash - Laundry Alternative Portable Washing Machine: Deal or Dud - YouTube. Non-electric, Hand-crank unit washes a 5-lb. load super clean in just a couple of minutes. New patent-pending E-Z lid lever much easier to use than older lid screw design. Drain out Easily:This washer automatically drains dirty water by drainage tube from washer,suitable for most family. Easy storage and space saving design. 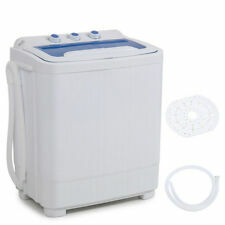 1XPortable mini washing machine. Wash Capacity:13lbs. Lavario's patented power flow technology is totally unique because it drives water through fabric with amazing cleaning action. Only minimal arm strength is needed because gravity does the work on the down-stroke and buoyancy makes the up-stroke easy. Featuring spin wash and spin dry. Spinner Power：25W. Featuring spin wash and spin dry. Rated Spin Capacity: 6.6LBS. When you turn on the water you have to stay by the washer to watch it because it does not stop filling with water by it self. A washing machine is common in each household. 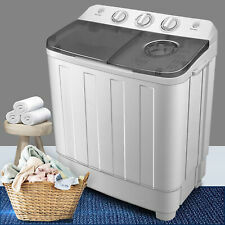 This semi-automatic twin tube washing machine is an indispensable machine for your daily life. It can help you to wash dirty clothes quickly. With the first-grade stainless steel & plastic & PP material, it doesn't break your clothes during laundry. TWIN TUB WASHING MACHINE. Stainless steel washing dewatering cylinder for its upgraded quality. Rated Spin Capacity: 3.8Lbs. Rated Spin Input Power: 120W. 1 x Twin Tube Washing Machine. Rated Washing Capacity: 6.6Lbs. Wash cycle can run-15 minutes. Wash spin cycle can run -5 minutes. Portable washing machine plastic material. Rated Washing Capacity: 3.0Kg. Rated Washing Input Power: 240W. Load Capacity: 6.6 lbs. TWIN TUB WASHING MACHINE. Stainless steel washing dewatering cylinder for its upgrade quality. 1 x Twin Tube Washing Machine. Rated Washing Capacity: 11Lbs. Mini and compact size with large power. Help to wash clothes quickly. BCP SKU: SKY3115. This portable washer is perfect for doing laundry on the go or in limited space. This machine takes convenience to a whole new level! Portable mini washing machine does laundry on the go or in limited space. Easily wash clothes & the machine will automatically stop when the load is done. Our machine features a drainage tube which allows you to easily drain out dirty water. Save water and electricity by only washing what is needed. The Laundry POD Portable Clothing Washer Manual Eco Friendly White/Green - New in open box. Shipped with USPS Parcel Select Ground. Designed for smaller spaces, the portable, eco-friendly Laundry Pod washer is perfect for washing small loads of laundry with a minimal amount of water and no electricity. Uses 6L of water and 1.5 tea spoon of laundry detergent. Silk Lux Portable Full Automatic Washing Machine - YouTube. It has 2 large lint filters that are easy to clean. If the load ends up out of balance, the washer will detect it automatically and try to balance the load. Trending at $204.00eBay determines this price through a machine learned model of the product's sale prices within the last 90 days. Multiple drying options and settings for all clothing types.This is for one NewAir 3.6 cu. ft. Electric Mini Clothes Dryer. & NewAir 3.6 cu. ft. Electric Mini Clothes Dryer. With multiple hot and cool drying options, you don't have to sacrifice on drying power with this small unit. Connect the washer directly to your faucet with the included quick connect kit and hoses for easy and convenient installation. - Washing Capacity 2.1ft. This table features a sturdy 3/4" (18mm) playfield for superior durability and playability. 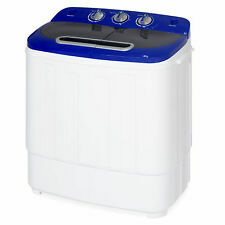 Portable Washer 2.1 Cu Ft Home Washing Machines Laundry Cloths Wash Electric RCA. Condition is New. Shipped with USPS First Class Package. Trending at $330.30eBay determines this price through a machine learned model of the product's sale prices within the last 90 days. Rated Spinner Capacity： 6.6 lbs (Half of the washing capacity, you may spin twice). Spinner Power: 110W. Spinner RPM: 1300. Portable Mini Compact Twin Tub Washing Machine. Rated Washing Capacity： 11 lbs. The machine features a built-in drain aluminum pump and a drainage tube which allows you to easily drain out dirty water. You can stop wasting hours keeping an eye on washing machine for its full automatic cleaning mode. Our Mini Compact Twin Tub Washing Machine, which is prefer for doing laundry in a compact environment. The Easy operation allowing you to simply put in your load of clothes and fill with water, then set the timer and start washing. Featuring spin wash and spin dry. As for a portable washing machine, this washing machine will be ideal for dorms, condos, motor homes, RV's, camping and more! With the this Portable Washing Machine at home, you'll no longer wince at the thought of laundry!. Load Capacity ; 9 Lbs (45L, 12 GALL Capacity ). Washing Can be Made Simultaneously. Compact Design And Portable. With Two Filter. Low Noise And Smoth Operation. Plastic Body Free From Rust. In addition, this machine features a built in drain pump and a drain pipe which allow you to easily drain out dirty water. With a built-in drain pump, automatic drainage. 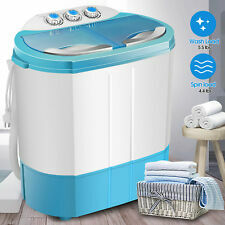 Mini portable washing machine, small space needed for this washing machine. Easily wash clothes and the machine will automatically stop when the load is done. Our machine features a drainage tube which allows you to easily drain out dirty water. Save water and electricity by only washing what is needed. Up for sale here we have aTechnosonic (Sears) Portable Personal Mini Clothes Washer Washing Machine Model PW311. The manual was misplaced and isn't included. This is a simple small washer machine and easy to use. Features high/low speed settings and convenient carry handle. 7-liter of liquid capacity. Washes loads of clothing weighing up to 1.75 lbs. x 18 1/4" H. Plastic. Model: PAN56MGP3. Lager size 1.6cu.ft capacity allows you to hold up to 11lbs. Boasting a unique, space-saving design, the Panda Compact 1. ft. Portable Load Washer makes your laundry easy and simple. Specially designed drain holes in lid allow water and soap to drain without removing laundry. High and low speed wash settings. Motor based. OUTER BOX MAY HAVE, SCRATCHES, TARES, FROM WAREHOUSE SHELVING.NO AFFECT ON ITEM.100% NEW. 15 Lbs Washing Machine Wash Spin Dry Cycle Laundry. Unlike Our Competitors ,Our Washer Feature A Built In Drain Pump Which Effortessly Automatically Drains Water From The Washer. MPN: PUCWM22. We are very proud to provide the laundry appliances with high quality and standards. Our products are easy to use, compact and save energy. Our products make it much easier to find a unit that is suitable for your specific needs.Features.